Revere Ware Parts :: Tips :: What happened to the stamp? What happened to the stamp? I have a sauce pot (not sure of size, but we use it for pasta), that looks exactly like the Revere Ware pieces I’ve picked up from antique stores, but is has no logo/stamp on the bottom. My question is, is it possible that any Revere Ware pieces were made without a stamp/logo on the bottom, or could it have been completely worn off with repeated use/cleaning? She is talking about the classic Revere Ware stamp on the bottom of the pot. This is not uncommon. 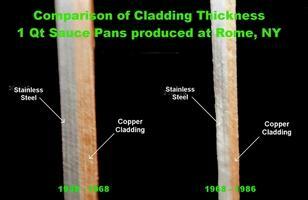 The older Revere Ware has quite a thick copper layer as depicted in the Revere Ware photo guide. We’ve seen on a number of occasions where the stamp has partially or completely been worn away from use, but the copper layer appears entirely intact. With newer (post 1968) cookware, this is typically not the case. Especially in cookware from the 90’s forward, the copper layer seems to be for appearance only, so that it looks like the older stuff, but it is not thick enough to do any good. We’ve seen the copper layer with bare spots, entirely worn off, and even in some cases where it has fallen off in one piece.